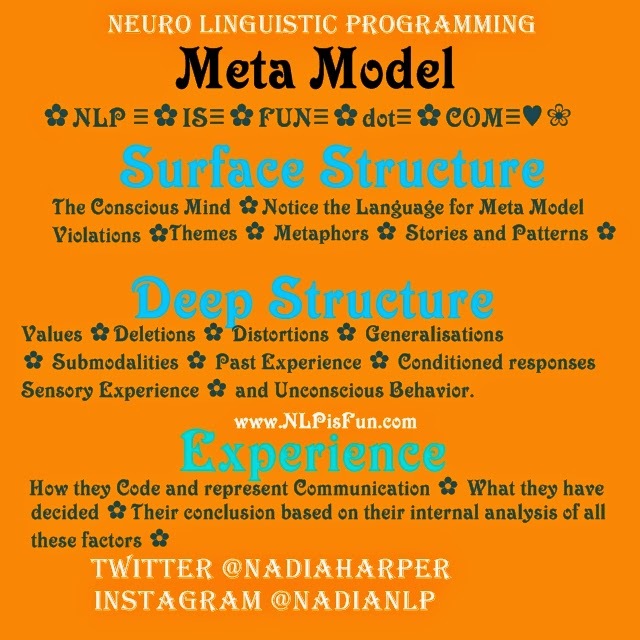 The NLP Meta Model is series of Language Patterns used in Neuro linguistic programming. The use of the NLP Meta Model is extremely specific. NLP Meta Model Language pattern is all about Information gathering. If you hear people in NLP speaking about the Surface structure they are speaking about the "Tip of the Iceberg" which is the persons way of using language via Stories, Metaphor, explanations and details that they want to share with you at any given time. This communication, has been prepared to be the most pleasing or effective in getting their point across coming from the Conscious Mind and is not necessarily congruent with the whole person. Is the way in which a Person sorts for information and processes through their own Communication Model. Just like their Knee Jerk reactions and responses, that they may not want to make public info. Their Map and their Reality. It is the way they have coded and Re Presented the Experience into their Neurology. If you enjoyed reading this Blog post from NLP is Fun, then please pass it on to those you know will be able to benefit from simple and thorough explanations about Neuro Linguistic Programming. Once you know NLP you can begin to change your own hard wiring. This will put you back into the drivers seat for challenging your own beliefs, Feelings and Actions. What Would you do if you felt better ? What would you take on if you began to feel more Empowered ? Are you willing to begin the process on investing in yourself ?